This App Entry has been selected for Round 2 ! Periodic updates about the progress of this app will be posted. 9/12/2013 Working on my GUI framework preparing it for the project. Waiting for both devices to be delivered, since I need to test each one to see how well they handle graphics. Plan on testing sprite engine and 3D OpenGL engine to see how well they perform on these devices. 9/13/2013 Experimenting with two Windows 8 mobile PC's, one an EXOPC tablet and the other a Lenovo (non-touch) laptop testing WIN32 controls, OpenGL and DIB based sprite engine to see how performance is and considering problems associated with WIN32 controls with touch. I need a baseline to compare the two Lenovo devices provided for contest to see how well they perform with graphics. Especially the All In One concerns me because of the high resolution (1920 x 1080). Full screen apps will push the PC to the max and I won't be using any DirectX, only GDI (DIBs) and OpenGL so performance will be a consideration. The tablet will be running on an Atom CPU, so performance will not likely be fantastic on it, so building an app which is "fast and fluid" for the desktop will be a challenge. One concern is how both devices handle OpenGL glDrawPixels function. OpenGL on lower end GPUs often poorly handle moving pixels using glDrawPixels. Bfore building the App I need to seriously consider what works well with touch and what will provide me with the best performance. This application would target the Education catagory for Tablets. Especially in education, there is a desire and need for building your own applications without being a programmer. Imagine a teacher who wants to create a simple, but useful application which students can use freely which is customized to exactly the needs for the class. Imagine students with a desire simply to create their own applications for class, for presentations, for fun or even for research. Better yet, the end user should be able to select different sizes for the drag handles which work best for them. The App Builder software would provide such an enviroment with real drag handles, true drag and drop and size, the ability to drag multiple objects at one time and a true snap to grid to encourage balanced and pleasing layout of the objects. The second aspect of this application would be a behind the scenes scripting language which can define all the user interface elements in a project, while also providing some kind of event syntax and features to make the user interface react to the users actions (ie. 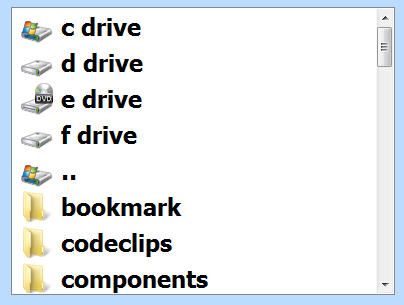 load a movie, animate an object, display some text, etc.). The third aspect would be a light weight runtime which can run a finished app so the end user can freely distribute the apps they build to others. The runtime needs to be transportable (meaning just copy and run) so apps can be run from USB drives, SD cards, etc. Also the more that the runtime can do of its own, rather than depend upon heavy graphic/multimedia content, the smaller such apps will be and they will be more easily shared. Now some objects in the design mode of the software need to be a bit more complex to provide more powerful features for the end user, so they can build much more complex apps. This requires tapping into more sophisticated and powerful user interface elements. Some objects could be higher level objects built from a number of lower level objects. 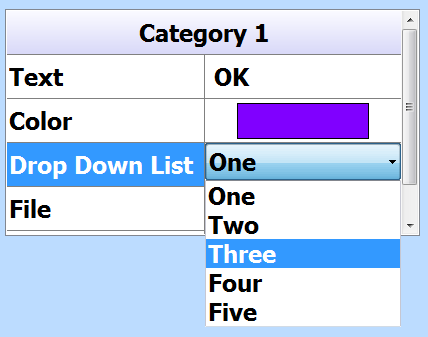 For example, a RichEdit control could be combined with a number of other controls to create a mini-wordprocessor (RichEdit based Text Editor) so a single object which is a mini-wordprocessor capable of editing text and formating the paragraphs as well as the fonts and colors of the text, would be useful. The end user simply drags and sizes a RichEditor into their app and little effort is required. But much more is required. 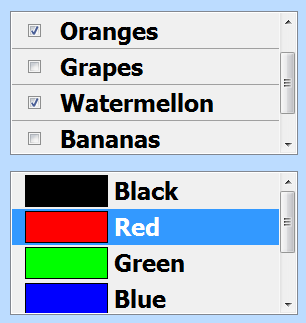 which is capable of defining catagory headings, text fields, drop down fields, color fields (displays color dialog to select new colors) or file fields (display open file dialog to select a file). Easy to use, powerful user interface objects allow the end user to design a powerful app with little effort. Graphic features and multimedia features would also be important for educational uses. Some objects need to be graphic oriented. But consider the challenge noted above, about trying to make the apps less dependent upon external content. It would be nice if the graphic features were designed so they can accomplish a lot more with a lot less. If bigger content is required, of course it can be used, but it would be nice to have some graphic features which can do a lot with less. At this point it would be good to explain the approach used in developing this software, which will better explain how the goals will be achieved. EZ_ODButton %FORM1_BUTTON2, .125, 5.6875, 16, 4, "Button", "T"
For multimedia, there is an MCI control which handles a large variety of built in multimedia in Windows including videos, MIDI, audio and CD audio. Now for Graphics I would be using all of the graphic features in the GUI framework. One useful tool will be to use the Turtle Graphics engine in the framework. This can be used to create vector graphic images which are scalable. For example imagine defining a map via a vector based list of lines and points. The map would be totally scalable and even when printing. Vector images using Turtle Graphics require little overhead and even children are smart enough to write Turtle Graphics using a simple Turtle Language. 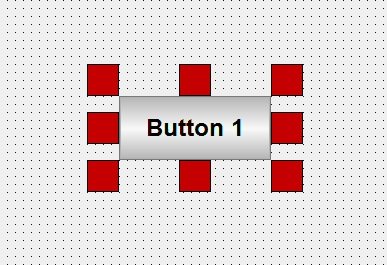 Next, I would be using the frameworks Canvas control for objects which need to be drawn on or animated. The Canvas control supports a 2D sprite engine which could be used for animation. It also supports an effects engine which allows layering of graphics onto previosu layers using things like alphablending. 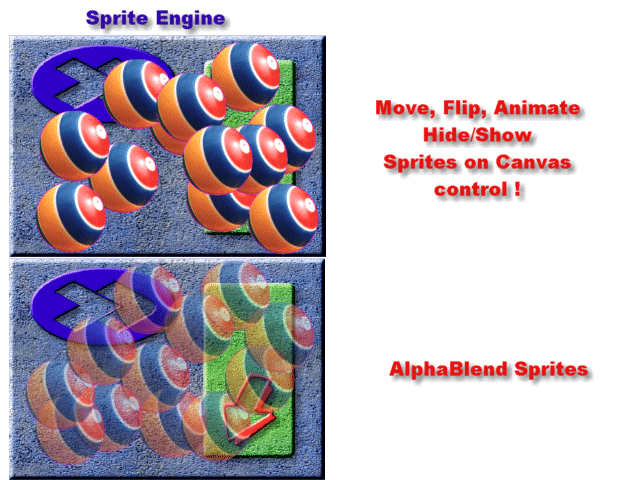 The 2D sprites allow a Canvas to keep sprite images separate from the background and they can be manipulated using anti-aliasing, frame animation and alphablending. Lastly, the glCanvas would be used for adding 3D elements. The glCanvas control is an actual window class, so it can be used for multiple instances of 3D objects like any other windows control and it supports a scripting language which can be exposed to the end user, where 3D primitives can be defined and even STL 3D models can be displayed. 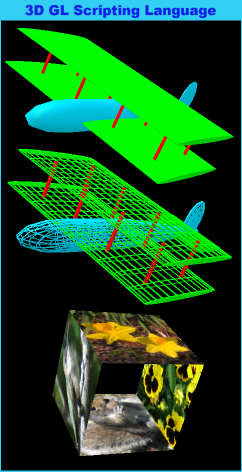 The 3D primitives allow the definition of many unique 3D objects, with minimal overhead to keep content lower. By using as much of the built in features of the GUI framework available, the total runtime for apps which end users create will be minimal and little extra external content will be required just to produce a useful and feature rich app. The GUI framework runtime is only about 1 megabyte in size. The apps created will also likely be very small in size too. The less external content required, the smaller the apps will be. The blog highlights a video one of my customers refered me to where a US large corporation (Chevron) is developing complex ROV's for working on pipes 6000 feet underwater. Some of the hardware for the equipment was developed by my customer and the software which runs it was written using my GUI framework. Being a software developer who writes tools for developers, rather than just end users, demonstrates my experience in programming, since my customers customers depend the quality of the software I write. Chris Boss is the owner (and programmer) of a small software development business in rural Virginia, called the Computer Workshop. For the last ten years or so he has been developing tools for use by Powerbasic programmers (see: http://powerbasic.com ). His main product called EZGUI (Easy GUI) is a high level GUI engine with Visual Designer and code generator. It is in its fifth generation now. He is an experienced Windows API programmer (more low level) and has experience in writing GUI engines (forms/controls), drag and drop Visual Designers, Graphics engines (printing and to the screen) and one of his favorites is a Sprite engine (2D animated movable images). His current project is version 5.0 of his main product EZGUI, adding such features as multi-monitor support, component engine, custom control engine, superclass engine and the latest project a 3D OpenGL based custom control. One of the goals he has is to push the limits of Windows software development, while making it easy, fast execution speed, small footprint (size of executables) and code reusability while providing a more graphic experience in user interfaces, while still being able to write software which can fit on a floppy disk (small footprint), use minimal amount of memory and able to run on multiple versions of Windows from 95 to Win8. Hey Chris, hope you're doing well! Just wanted to check in and see how developments going and thank you for filling out the Round 2 Dev Survey. I'll be checking in with Intel to see if there are any flat API resources available as per your request. When you create good Apps, that's brilliant. But when you create a software through which brilliant apps can be made, it's awesome. And when that awesomeness is delivered by Chris Boss, it got to be something one must wait for. Congrats Chris. Best of luck with the Application.